After recovering surprisingly well in the week following Perth Marathon in June this year, after talking with a local ultra runner and event organiser, and with the support and "just give it a go" attitude of my mountain biker husband, I decided to capitalise on the fitness and endurance I'd gained through marathon training and work towards the Waterous Trail on Foot 50 Miler (WTF as it's affectionately known - you can make the connection). There is also a 100 Mile option which runs Through the Night, which is the event's slogan. This event was once run on the Waterous Loop Trail south east of Perth, but has since moved to the Munda Biddi mountain bike trail which my hubby knows like the back of his hand, so I could utilise his navigation and company on reccy runs. Having never run more than a standard marathon before, and only doing that distance twice, on a flat road course, the prospect of running 82km on a hilly (by Perth standards) trail was more than mildly terrifying. I Googled a few training programs and pulled something together that I thought I could make work with kids, work, and life, and started training. Most programs I found were 16-20 weeks long and suggested a 4-6 week post-marathon recovery before starting, but I only had 13 weeks until the event on September 26th, so 13 weeks it was (and I just ignored the part about marathon recovery)! I was hoping I wasn't going to be hopelessly underdone. The prospect of rocking in the foetal position under a tree somewhere beyond 42.2km, with only snakes and kangaroos for company did cross my mind more than once. A favourite mid-week training run I do is an 8km tempo. I like running 8km. I like getting to 5km and only having 3km to go. So in my head I upscaled this concept by a factor of 10. Let's forget the extra 2km (because quite franky when you're up to 80km are you even still counting?) - once I get to 50km I'll only have 30km to go. It's just like an 8km, right? Concept sold, to yours truly, by yours truly. Yet another running mind game. I was going to need a few more than just that though to get me through potentially 10 hours on the trail. My program built up to a couple of 100km weeks, with most weekends having a long (read: stupidly long) run on Saturday followed by a shorter run on Sunday. Fitting all of these runs in meant getting up at stupid o'clock most Saturdays to fit in up to 5 hours of running without eating too much into family time. This all happened towards the end of winter/early spring while it's still quite dark at stupid o'clock in Perth. I bought a cheapy ebay headlamp which turned out to be great, and roped in at least one other person to join me for part of my long run each week. I took my running gear on our winter camping trip up north and hubby would kick me out of the car in the middle of no where and pick me up in town. 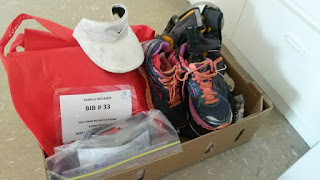 Donned in long sleeves, long pants and gloves, ready for wind and rain (and boy did it rain on a couple of those runs), the longest individual runs I did were a 48km trail run and a 50km on the footpath. Getting those runs under my belt gave me just enough confidence to think I might actually complete the entire 50 miles (even if some crawling was required). Fast forward to race day. Stupid o'clock turned out to be 3:30am to get ready and drive to the start line for a 6am start. Day was just breaking and it was cold. I started with long sleeves on top of a singlet, long tights and gloves. The plan was to strip down layers as necessary over the day. I had drop bags at each of the 4 aid stations so I could offload some attire along the way and grab some nutrition. This is probably a good point to mention the volunteers on the course. I didn't have a crew and so was relying on myself (in a physically deteriorating state as the day was to progress) and the assistance of some volunteers to help me out with water & food along the way. They definitely came through with the goods. The vollies on the course were amazing, without them I would have been reduced to a rocking, hysterical ball on numerous occasions (more of that to come). If any of the vollies are reading this, you guys are da bomb! Back to the race (where race = constant forward motion with no accompanying speed in this instance). The gloves were dumped at Aid 1, where I didn't stop more than to throw them into my clear zip lock bag (which I didn't retrieve until more than a week after the race - they could have walked themselves home! ), and continue. I didn't want to break rhythm so early in the game by stopping. I'd been running with three other runners who were also first timers at the distance. We knew that we were probably being a bit ambitious with pace as most kms were around 5:30 min/km, but were walking the hills (with purpose! - a mantra I had practiced in training) to save the legs and figured slowing down was inevitable later in the day so we just stayed comfortable and didn't look at the watch too much. We all had a goal of "under 10 hours" and found the company helped pass the kms. Aid 2 came and went - I filled my hydration back and offloaded some rubbish but wasn't there for any longer than necessary. By that stage our group of four had split in two and I knew at that point that I was lead female. In the lead up to the event a few different people had suggested I was a good chance to place, and I'd largely ignored those comments as my only goal was to complete my first 50 miler and I didn't want any added pressure. It was at Aid 2 however that the pressure began to creep in. It became a game of holding my place - something I've not been terribly good at over shorter distances in the past. I knew there were at least two other women (who both have more endurance experience than I) not far behind and I was just waiting for one or both to come steaming past at any moment and leave me in their dust. Somewhere between Aid 2 & 3, my trail buddy broke away from me and as I came to a turn in the trail I saw him up in the distance, going the wrong way. I had completely forgotten his name at this point (I've never been good with names), and so yelled a non-specific "cooooeeeeee" until he turned around. I waited for him to catch up and off we went again together for a while. It wasn't long before he broke away again though, and I was flying solo. Only there wasn't much flying happening. I hadn't run this part of the course before and it felt mountainous. It was at some point leading into Aid 3 where the wheels started to fall off for me. I'm not sure if it was as I passed the 50km mark and entered previously uncharted territory, or if it was the middle of the day and things were warming up (and I was still wearing my long sleeves), but as I stumbled into Aid 3 at 55km, one of the vollies asked if I was ok and if I was going to faint. I didn't realise I was looking quite that bad but stammered out "water.....head" and they obliged. I had only eaten Clif Shot Bloks and a banana up to this point and more than five hours had passed so it was probably time for some real food. I scoffed a stack of about 8 Pringles from my drop bag and a salami stick that someone handed me. OH MY GOD! That salami stick was hands down the tastiest thing I have ever eaten, ever! And I don't even like salami. It somehow breathed life and healing into my muscles, lungs and soul like nothing ever had before. Salami-induced euphoria - it's a thing! The vollies filled my pack with water and fed me electrolytes out of my drop bag, and again I was on my way. Even with magic, euphoric salami running through my veins, nothing could detract from the fact that my body had absolutely no idea why my head was insisting on continuing with the torture. The next aid station was only 11km from the last, the shortest distance between any two aid stations, but those 11km felt like the previous 55km and more. One of the girls passed me somewhere in here and while I wasn't sure whether to curse her, hug her or cry, I felt the pressure of being in first place lift. I thought I'd be more upset about losing it, but even though I was mad at myself for hitting a wall so early, I was relieved. There were hills like I didn't remember, even though I knew this section of the course well, and at 60km I was reduced to tears for the first time (not the last mind you, the valve had been opened). I had pre-warned a friend that if the proverbial sh*t hit the fan, she may get a phone call. And phone call she got. She had also been warned that the only answer was "keep going, don't stop" which she fed me smoothly. We worked out that I only had a half marathon to go, and as I reached the top of a hill I had walked the entirety of while on the phone, I promptly told her I had to hang up and run down the other side so as not to waste a downhill. She continued to send me motivational images via text for the rest of the afternoon. I somehow made it to the final aid station, known as Treasure Island. The vollies at this aid station (whose surname is Treasure), put on the best spread you could imagine, in the middle of nowhere. There were Tim Tams, Nutella sandwiches, boiled eggs, potato chips, coffee, coke..... the list goes on. They even had pizza delivered there later in the evening for the 100 milers as they passed through. I was so relieved to have completed that last section that I ripped my back off, passed it off to someone to fill with water and sobbed uncontrollably on the trestle table. This took both myself and the volunteers by surprise and yet again I was asked if I was going to faint, or vomit this time, and did I want to sit down. I was to do neither, and certainly didn't want to sit down for fear of never getting up. I just needed a couple of minutes to recompose. Mrs Treasure gave me a big hug (for which I will be forever grateful), I skulled from an open can of coke I found on the table, the owner of which I neither knew nor regarded, grabbed another salami stick and went on my way. Sixteen kms to go. I had this. I was actually going to finish. A few hundred metres out of Aid 4, up another disgusting hill which I was walking, I saw the female who was in third place. She had taken a wrong turn somewhere and added a few kms. Given how close she was now, I knew it wouldn't be long until she too overtook me. She was looking much fresher than I was feeling, despite a detour. I continued on, passing one runner who had missed the aid station (and hence a 6km out & back section) and was coming back to finish it and avoid a DQ. I was reduced to regular walking breaks by this point, but was beyond caring - I was going to finish by whichever means possible, and even if I did little more than walk the entire last 10km I would still come in under 10 hours. I'd just finished these calculations when I came across another runner who'd missed the aid station. We were a good 6km past Treasure Island so he decided against a 12km deviation to rectify the mistake, and to continue on with me and tack on some kms at the end to make up the distance. Missing the aid station however had meant missing out on the opportunity to refill his water. I was carrying a small bottle of electrolytes as well as a freshly refilled pack of water so I gave him my electrolytes and decanted some of my water into an empty bottle he was carrying. Missing the aid station had also meant his crew were still there waiting for him, not knowing why he hadn't yet arrived. I had better reception on my phone than he did, so we used that to let his crew know what was happening. While all this was happening, we were continuing to walk the uphills and run as much of the downhill and flats as we could. Both feet, but my left in particular, were really starting to hurt by this point and I was convinced that multiple bones were broken and that I would turn up to work after the weekend in a moon boot (possibly two - hysterical melodrama had now been added to the list of emotions experienced throughout the day). Every time I started to run, it would hurt so much that all I could manage was a few hundred metres at a time followed by walking. Cue tears #3. The thought of walking the last 7km was more than I could bear. We passed Marrinup camp site and my trail buddy #2 decided to hit up some campers for some water. I decided not to wait for him and just get this thing finished so continued on in a pattern of run 300m (or until I could run no more), walk 100m. Soon there were 3km to go. I ran a little more in excitement but soon needed another walk break. Then the fork in the track appeared. You go right to the town, or left to the caravan park and finish line. I rounded a left and saw a small group of people and a finishing tape between two trees. It was the sweetest finish I've ever experienced. No giant crowd, no spectators lining a finishing chute, no timing clock, just a few friendly faces, most which belonged to finishers before me and spoke of the pain and excitement I was feeling. I had just run (well run a decent chunk and walked more than I had anticipated of) 50 miles in 9hrs 17minutes and 50 seconds and come in as 2nd female and 8th overall. It then occurred to me that I never had been overtaken by the women in 3rd place. It turned out she had taken another wrong turn and added even more kms to her day, but still crossed the finish line with a giant smile and seemed to be in less pain that myself. I was hurting like I have never hurt before, and while I couldn't negotiate anything other than flat ground and my feet resembled something from a horror movie, I was buzzing on endorphins. Hubby and the kids had gone to Marrinup to see me pass through, but I'd beaten them there. I called to find out where they were and politely warned him not to show up without a giant iced coffee. He came through with the goods and my girls fed me lollies they had brought. I had to use my hands to manually pull my legs into my car for the few days that followed, and couldn't negotiate the single step down to my driveway without sliding my back along the house and walking my hands down the wall, but I think I may have just caught this ultra running bug, and the trail running bug to boot! So life has taken over and I have, in all seriousness, had no time to write about it. Chicky is 7, Poppet is 5 - both are in full time school - and Blossom is nearly 3. I've gone back to work part time and to be honest I'm starting to forget things so I thought maybe I should try and document some of them again, for my own sake if for no other reason. I'll start with running as it's the one I've been doing most of lately. Last year I decided to train for and run my first full marathon (26.2 miles or 42.2km for those not familiar). The Perth Marathon was held on June 15th, which was my 32nd birthday so I thought there was no better race to choose. As a winter race, there were no disgusting 35C+ training runs like you get in the summer months, it's a local event on a familiar course (I've run a few 10km & 32km events on the same path), and well, it's my birthday and I'll run if I want to. Training didn't go as smoothly as I would have liked and I wound up with a decent flare up of plantar fasciitis come race day, but that wasn't going to stop me. My usual race-day demons stayed away, I think largely due to my lack of any real expectations. Having never run more than 36km, I had no real expectation of time. Those who know me will know that's not entirely true, and while I did have some sort of goal pace in my head, I 1) wasn't holding myself too accountable to it, and 2) wasn't sharing it with the world. I very happily completed the 2014 Perth Marathon in 3:37 and was honestly stoked. 2015 has been an interesting running year for me and there has been more happening than I can write in one post. I started the year with high (read: delusional) hopes of a year full of PBs - 5km, 10km, half marathon and maybe even marathon if I could commit to the training. There were some disjointed bouts of training, motivational slumps and my first ever DNF (the first 3km didn't go to plan and instead of sucking it up and doing what had to be done, those pesky demons took over and saw me stop running 5km into a 10km race and walking back to my car, sobbing). I realised that the individual race probably wasn't to blame and that experience made me reassess my reasons for running. The ensuing soul-searching lead to the ditching of my GPS watch for a while and getting back to the basics of running. It was refreshing not worrying about pace or distance, and relearning how to put one foot in front of the other and soak up the endorphins. I entered my first ever trail event on a whim. 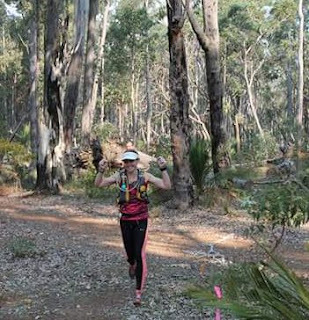 A 25km hilly c ourse in Serpentine, south-east of Perth in April. I loved every minute of it and much to my surprise, came in as 3rd female and got this very cute trophy. Before I knew it, it was May and while I hadn't been knocking off the PBs like I had planned, I did manage a 10km PB in a bout of post DNF anger, but it wasn't recorded anywhere other than my own Garmin. 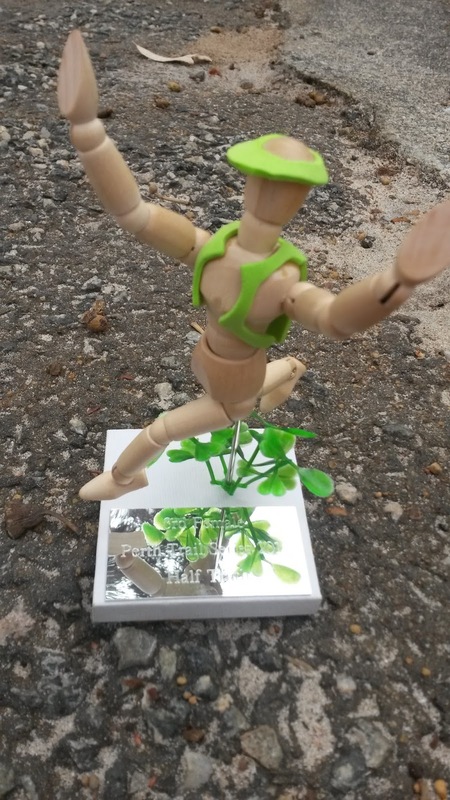 My running buddy had started training for Perth Marathon, and I loosely started to up the kms and follow a vague program but didn't want to commit. I'd started and stopped training for a few different races during the year and I wasn't sure if this would be any different. We both did a non-competitive, local half-marathon that very conveniently started and finished 15 metres from my doorstep. We were both getting ourselves into pretty good form, and I ran the Perth 32km at a pace faster than my half marathon PB, so six weeks later, decided to give the marathon a crack. It was to be a 'no pressure, run hard but don't get disappointed regardless of the outcome' kind of race. Unfortunately my running buddy landed a high hamstring injury just three weeks out and couldn't run. I felt devastated for her, and awful that I was fit enough to run the race I'd haphazardly tacked onto her training for. I almost let this demotivate me, but decided that she would have given anything to make the start line so given I was fit and healthy, I owed it to both of us to give it a crack. The day before the race I woke up with an awful head cold and spent most of the day horizontal with a tissue shoved up one nostril. I didn't have a temp though, and have run with a cold before so I decided not to even think about it and just see how the run panned out. I car-pooled with a friend who was covered in deep-heat so my nose was nice and clear by the time we got there. The head cold turned out not to affect my race at all. There is normally an element of snot flying during a hard run so it wasn't much different! I wore my favourite Mizuno Sayonara 2s. For someone who runs most of my kms in a stability shoe, these shoes feel flat and fast. I absolutely love running in them and when they're on, I always seem to fly. They had served me well for the Perth 32km so my shoe choice was a no brainer (as was my choice of socks - Lulu Lemon 'Run Like The Wind'). The weather was perfect - still and cool, and the reflection of the city skyline on the glassy Swan River was picturesque. Aside from the dripping nose and sore throat, everything was in its place. I set off slightly ahead of my planned 4:55 min/km pace, but I always do the same thing and treat it as "time in the bank" for later. The 4:50s kept ticking over surprisingly comfortably. I was taking a Clif Shot Blok (black cherry flavour of course) every 5km as planned, and my energy levels remained constant. At about 25km, heading out onto the second and last lap, my ITB started hurting and threatened to derail what was panning out to be a perfect marathon. I'd seen an ambulance on the side of the course along the first lap (precautionary, no one was hurt) alongside which someone had written a motivational banner saying "SHUT UP LEGS". I clung to that mantra. I repetitively told my ITB to shut up, and surprisingly it did! I kept ticking over the kms. Someone was breathing hard over my shoulder for about 10km in the second half, and I never saw their face as they dropped back towards the end, but that breathing kept me moving forwards. By 35kms things were getting pretty tired, but I stuck to my nutrition, taking water at aid stations and counted down the kms in a sing-song fashion (which is something I tend to do during any long training run or race) - it goes a little something like "7kms to go, 7kms to go, 7kms to go..........[until] 6kms to go, 6kms to go.....". You get the picture, I never was very creative. This got me to a few hundred metres short of "5kms to go" where there was a timing sign. I forget the exact time it read but it must have been a bit over the 3hr mark because I remember trying to do the maths, but my foggy tired brain couldn't work out the exact numbers. I knew if I picked things up just a touch I might be able to go under 3:25. My goal was only ever a PB on last year's 3:37, but McMillan had predicted a 3:26:something so I knew it was going to be close. I tried my hardest to hold onto those 4:50s, but had a few kms around 4:55 and as I rounded that last bend I even busted out a sprint finish to cross the line in 3:25:10. I was stoked, regardless. Twelve minutes quicker than last year with only 9 weeks of training. My girls lined the final stretch and the oldest even ran along side me for a bit before I entered the finishing chute. It wasn't a terribly competitive year for Perth Marathon, and that time got me 15th place. I was happy to be on the first page of the results! 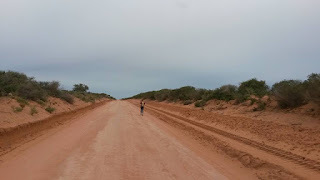 While I could have taken some time off to recover and relax, I was running again 3 days later and convinced myself that I should capitalise on the fitness, endurance and fantastic recovery. So what does someone who's having a very undulating running year do? Sign up for a 50-mile trail ultra marathon (pun intended). But I'll leave that story for another post. With running in my local neighbourhood taking off like wild fire, a host of new to intermediate runner's ailments are popping up for discussion. While most are injury-related, another common theme is mind-training. Once, the initial euphoria of merely completing an event was enough to satisfy the soul, but as the beginner runner turns the seriousness up a notch, the metaphorical devil on one's shoulder often rears it's ugly head. Why is it that the body is always stronger than the mind? How can we overcome this and achieve our running goals? I've had a few recent discussions with people about training both mind and body so thought a post about the mind games of running was timely. We are designed to run, IF SOMETHING IS THREATENING OUR SURVIVAL. Sure we do the bipedal thing pretty well, our centre of gravity is fairly central through our midline, we've got giant glutes (some more giant than others) to propel us forward, unusually large feet for a mammal - I could don my David Attenborough cap and go on, but you get my point, we're not that bad at running. This is a great evolutionary adaptation to pull out when you're being chased by something that wants to eat you. Our fight or flight response usually makes us run, until the threat has gone. In reality that will happen (or you'll become lunch) well before 42.2km, or even 1km for that matter. So it's not that surprising that our head tries to tell our bodies to go have a nap after 1 rep of Yasso 800s. We're designed to conserve energy until it's needed, not run 100 miles through the night all for a small piece of metal we can use to help hold our pants up. Humour aside, I'm sure this information isn't new to most runners, but it is useful to remember so we can push ourselves through the tough training sessions and the low points in a race. I am by no means an expert at taming the anti-running devil within. I'm not actually very good at it (as I've discussed before, more than once) and have had more than one race failure, where I let my mind convince my physically capable body that slowing down (or stopping) and throwing away all the hard earned training was somehow worth the relief on the legs and lungs. It wasn't. It sucked big time. So over the last year or so I've tried to compartmentalize all the little tricks that help push through the pain. 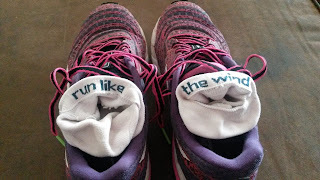 To the new runner, there is only one piece of advice I ever give. Slow. Down. If you find yourself stopping after 200m or your breathing is so laboured you can't utter a word, you're going too fast. It's well worth building a little slower-paced endurance before trying to smash out some intervals. Let your body feel what it's like to get comfortable running even if it feels like you're barely shuffling. Speed will come later. Join a running club, drag a friend out there with you, try and chat through your runs. Before you know it you'll have run a km, then 5, then who knows what the limit is. Now to those who have a bit more running under their belt and struggle to push through the distance barrier, or to hold pace for that interval, or to make it through the final kms of a race, here are a few things that have worked for me (in no particular order). Even when I'm not training for anything specific, I like to follow some sort of program. It normally includes a long run, at least one interval or tempo session and some easy stuff. I know that Wednesday is pain day, but that means more often than not that Tuesday and Thursday are easy days. I look forward to long run Sunday, as I often get to catch up with a friend, run through day break and push the endurance limits while clearing my head of the week's chaos. Cross train if you like. Training the cardiovascular system in any way will improve your running. Mixing it up keeps the training interesting and the different types of runs give you a variety of goals to work towards (speed, distance, number of intervals before collapsing in a heap etc). It also stops you from getting bored. Never under-estimate the power of peer-pressure, and I don't just mean in training. Hold yourself accountable by telling someone (maybe not the whole world as too much pressure is fuel for the little devil) of your goals. If you think someone is expecting something of you, you are more likely to put in the work and not give up. There is generally only one person I tell of my running goals, and who you pick is a personal choice (the dog doesn't count), but accountability works wonders. Along the 'Run with friends' theme, run with someone who's faster than you occasionally. This helps you push yourself further than you might on your own. The best intentions in the world won't make up for lack of training. If you're a bit under-prepared for a race, admit that to yourself and shift the goal posts. No one can run a 3:20 marathon just because they wrote it on their fridge, and trying to without the preparation will end in tears. Being well prepared for a race (and hopefully getting there uninjured) can fill you with the world of confidence. Not everyone is like this, but I'll be confident of a goal time if I can run a third of the race distance, at goal pace, a few weeks out, and recover well. Use the McMillan online calculator. It is an exact science that, given appropriate training, is yet to disappoint me. McMillan predicted my first marathon time to the minute. I cannot sing its praise loudly enough. "They" claim that the last 6km of a marathon is all mental. The next few points are directed largely at those last 6km (or equivalent proportion of a different distance). Any distance can seem daunting, so break it up into less daunting parts. Celebrate making through the first 3 of 6 intervals by saying "more than half way" as you start number 4. Break a 10km up into quarters. 2.5km is much easier to swallow than 10, and once you've done 2, only 2 more to go! I like to break the marathon up into 6 x 7km legs. Counting down 42.2km in 1km increments can make even the most seasoned marathoner become disillusioned, but chopping the session up into whatever distance you feel comfortable with will help to get the job done. Use the next aid station as your immediate goal, or the next gel. I even use this on the treadmill. I'm allowed a drink every 2km (even though my water bottle is right there all the time), so every 2km I celebrate with sip of water. It may not seem like much of a celebration, but when you're trying to push through the pain barrier, you'll take anything you can get. You may laugh, but I have done this with success. Have you ever been chased by a dog? The adrenaline that gets pumped through your body will have you giving the best 100m sprinter a run for his money. It doesn't have to be a dog. Pick your deathly-creature of choice. Are you terrified of snakes? Spiders? Clowns? They're chasing you, and they want your blood. Now run! For me this is a no-brainer. Childbirth x 3. Number three will be really quick they said, she'll just slip out they said, stake out at the hospital in case you go into labour they said. Thirty-six hours, and 25 hours of back to back contractions later, the sweet little cherub made her appearance. Unless something goes horrifically wrong, no run I ever do will take 36 hours. Point made. Three and a half hours to run a marathon is a privilege in comparison. I read this on a blog a while ago, and it has merit. Think of how lucky you are to be physically/mentally/freely able to run intervals, enter a 10km event, try and run a PB parkrun. There are many out there who would love to do these things, given the chance, so do it well. Deep stuff! This could be anything. This could be tucking in behind some big burly guy and holding his pace for as long as you can. It could be reading some scrawny motivational sign that a goofy spectator is waving. It could be keeping the advertising slogan on the back of a stranger's shirt in sight. At Perth Marathon this year there was an ambulance (of all things!) parked up at a medic tent and in huge writing on a sheet wrapped around it read "SHUT UP LEGS". The first time I passed it I laughed. The second time I passed it I thought "That's got some merit". By km 25, when my ITB started hurting, threatening to ruin my perfect marathon, I just kept saying "YEAH, SHUT UP LEGS! SHUT UP!" and even though my knee didn't stop hurting, it helped me to push the pain to the back of my mind and not get distracted from the job at hand. This was the most prophetic moment in my battle against the inner demon. I spent around 4 years working with the "you want this so badly, just do it" mantra. One day I realised I didn't actually "want" to run 10km in less than 45 minutes. At the 5km mark what I really wanted was a hot bath, a piece of chocolate cake and to not be running 10km. Then I discovered it had nothing to do with the run itself. It had everything to do with wanting to be strong. 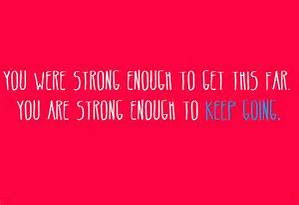 Mentally and physically strong, and running is just the outlet I have found to work on those things. I stopped telling myself I wanted it, and started telling myself I was strong enough, that I had worked hard enough and that I was capable. The day after a 10km DNF where I let the devil win when I knew my body was capable, I realised how strong I have become and ran my fastest 10km - on my own, in the dark. Find whatever it is that you need to tell yourself to make it happen. Maybe like me, it will take 9 years of running to figure it out, but when you do, it will be amazing. When all your tricks fail, forget the goals, forget the pace, the distance, the splits, forget it all and just run. Remember the reason you started running, and the reasons you continued, the things you love about running, the people you run for. Hold them close to your heart and just run. I made a few cakes last year, and didn't have time to blog about them at the time. 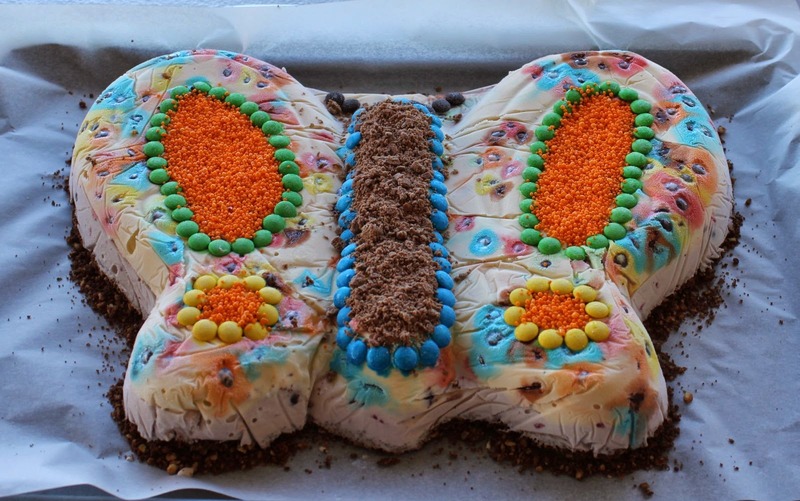 I thought a nice way to recap on a year where I didn't have much time to blog about anything really, was to revisit the cakes of 2013. Each of these cakes was for a birthday. In September, we invited my brother-in-law and his new wife over to celebrate her birthday. I have mixed feelings about birthday presents. I don't see the point in buying someone something they don't really want, just to give them a present, but I will happily make anyone a cake of their choice. 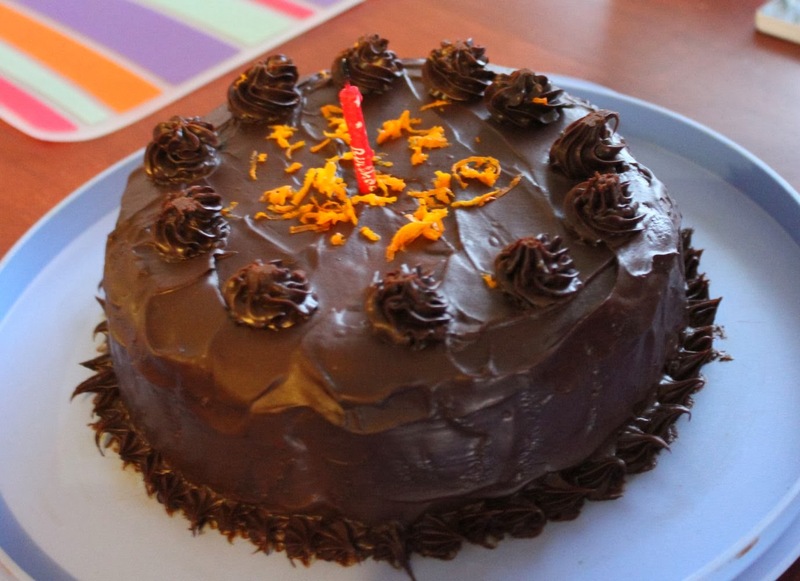 This year the birthday girl requested a flourless chocolate orange cake. I had never made on before so readily accepted the challenge. Google led me to Nigella Lawson's recipe. I topped it with a very evil chocolate ganache and wow, this was such a delicious cake, the 2 hours of cooking an orange on the stovetop was well worth it! Unfortunately the only photo I got was an out of focus last minute shot before this cake was devoured. Hubby turned 31 this year, and he is a bit partial to a cheesecake. On his birthday he chose to celebrate by concreting the floor in the newly built shed. This involved about 6 family and friends, an equal number of wheelbarrows and two giant trucks of concrete. 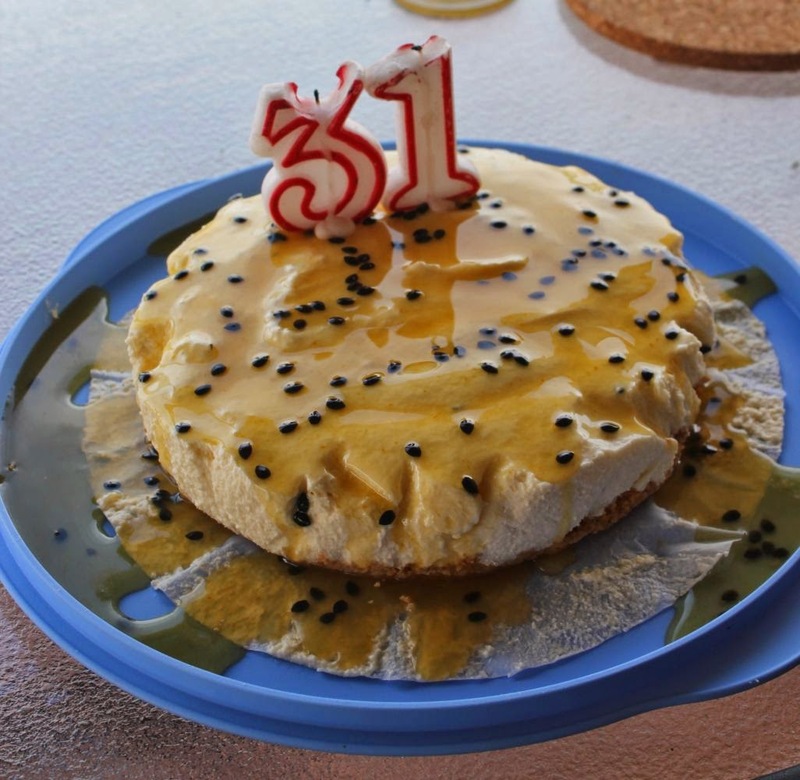 To feed the starving masses, and to remind Hubby that it was in fact his birthday, I made this passionfruit cheesecake. Unfortunately, I can't lay claim to this next cake. 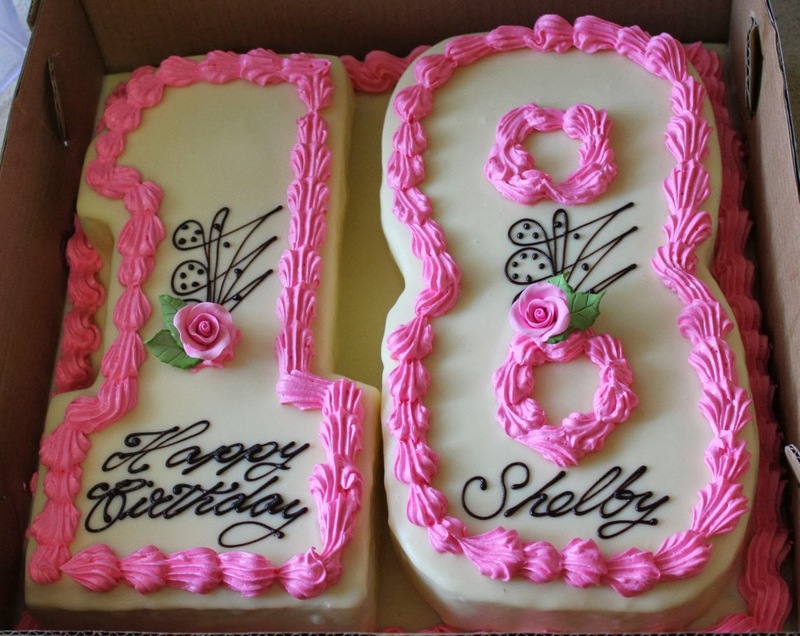 This dense chocolate cake with white chocolate ganache icing was professionally made for my niece's 18th birthday. It looked and tasted divine and thought I'd include it because it was just so pretty. ....and now I have her on my lap as I type. While Chicky and Poppet giggle hysterically, telling "poo jokes" and chasing each other around the kitchen, Blossom watches longingly. If only the chubby 10 month old was mobile, she'd be able to join in. One day soon, before I have toddler-proofed my house no doubt, she'll be on the move. But I digress. My kitchen this month hosts several new additions. Some edible, some not, and some in preparation for the holiday festivities. 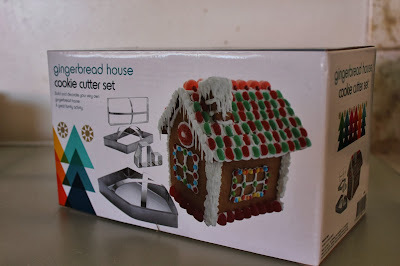 The girls and I had fun making a gingerbread house last year, and while I made a paper template for the walls, the template didn't move house when we did. I saw this cookie cutter set in Kmart for around $5 (the exact figure escapes me) and couldn't resist. This way the girls can get involved in cutting the walls as well as mixing and decorating. I don't really like shop-bought fruit mince pies, but have made my own for the last couple of years and really enjoyed them. 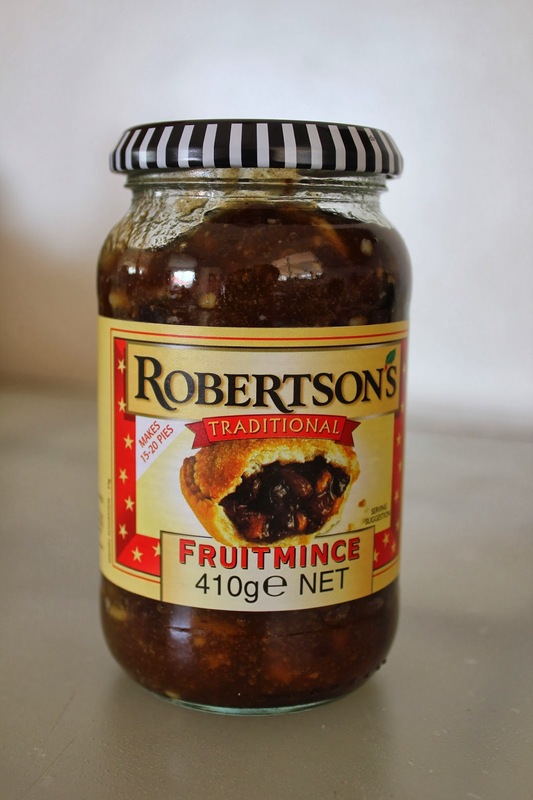 In preparation, I have a jar of Robertson's Fruit Mince. This is the only fruit mince that was in my mum's pantry when I was a kid, and it has never even crossed my mind to purchase a different brand. I am yet to pluck up the courage (or find the time) to attempt chocolate tempering, but I figure if I own a digital thermometer, I may be more likely to give it a go. Celia makes it look so easy, maybe this holiday season is the time to try. I picked up this nifty little thermometer from JayCar for less than $25. It is accurate to 1 degree Celsius and can tolerate up to 300C. Unless something goes terribly wrong, my tempering attempts won't reach such extreme temperatures! I have my eye on a raw carrot cake recipe that I'd like to try. 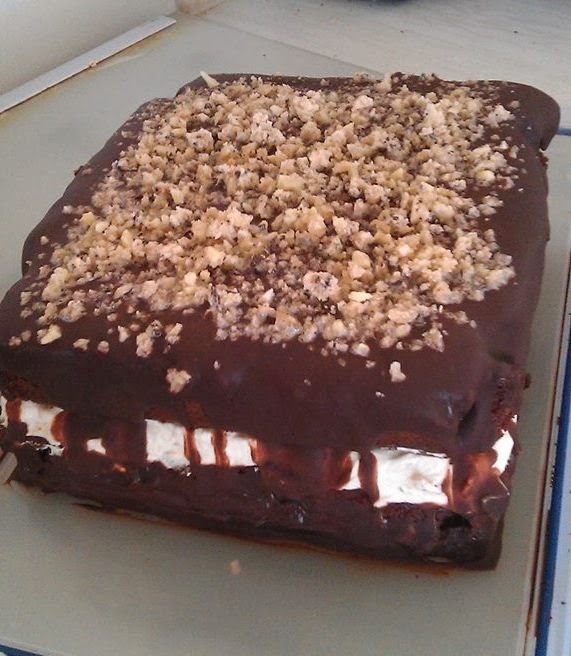 The recipe I saw on a Facebook page, but can't find a direct link to the recipe. When I make it, I'll be sure to blog. 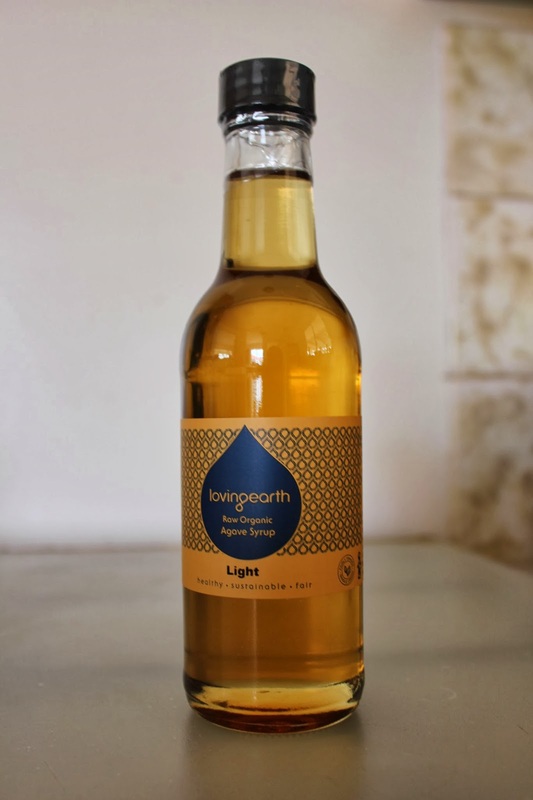 The recipe uses raw agave nectar, which I've had my eye on at our local grocer, Malibu Fresh Essentials, for a few months. This was the perfect excuse to pick some up. 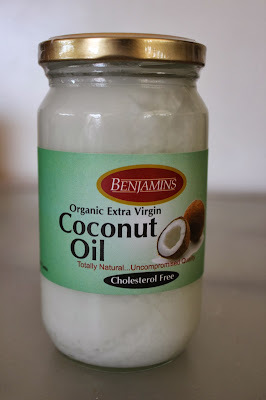 Something else I've been keen to pick up, and another ingredient in the carrot cake, is extra virgin coconut oil. I hear this stuff makes a great moisturiser too! Yet another Malibu Fresh Essentials purchase which makes it into my kitchen regularly is pre-packed dried fruit and nuts in various shapes and sizes, these are Nature's Delights brand. Hubby loves cashews, and will often use my measuring cups to hold his post dinner/pre-bed snack of cashews.The "Delicious Mix" of almonds, pistachios, cranberries and white chocolate buttons isn't a regular in our house because it's a bit too naughty, especially at the rate I go through the bag. 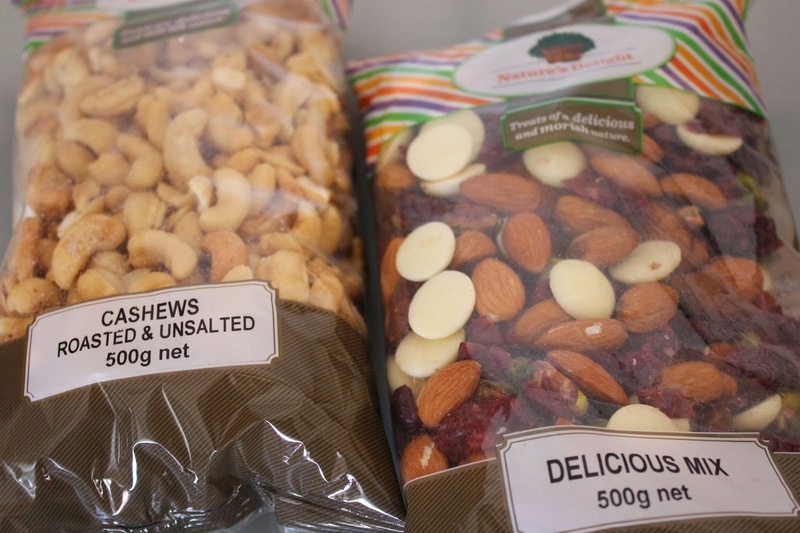 I prefer a similar mix with raw macadamia nuts and pepitas. 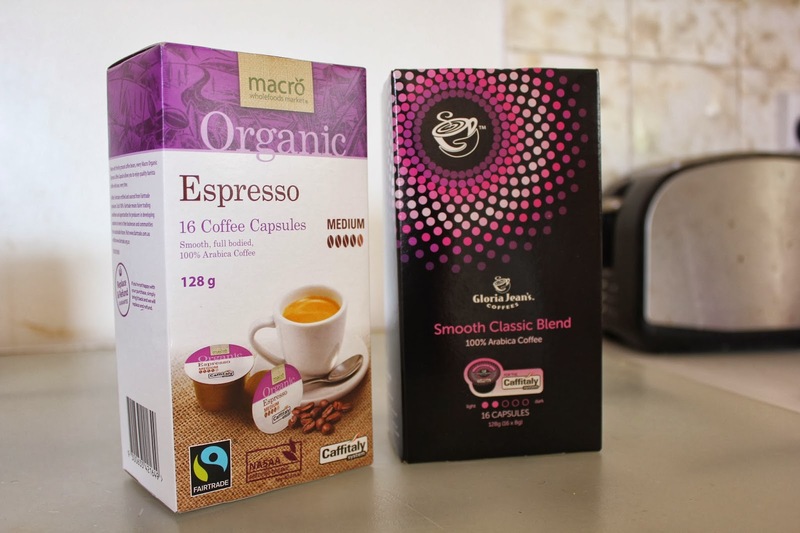 Coffee pods to suit my Map coffee machine are ALWAYS in my kitchen. I normally buy the Gloria Jean's Smooth Classic Blend (pictured right), but Woolworths have started stocking a variety by Macro. Macro make some pretty tasty stuff, so I thought I'd give them a go. I still prefer the Gloria Jean's variety. This one was in my kitchen on Monday, then I cooked it, then we ate it. 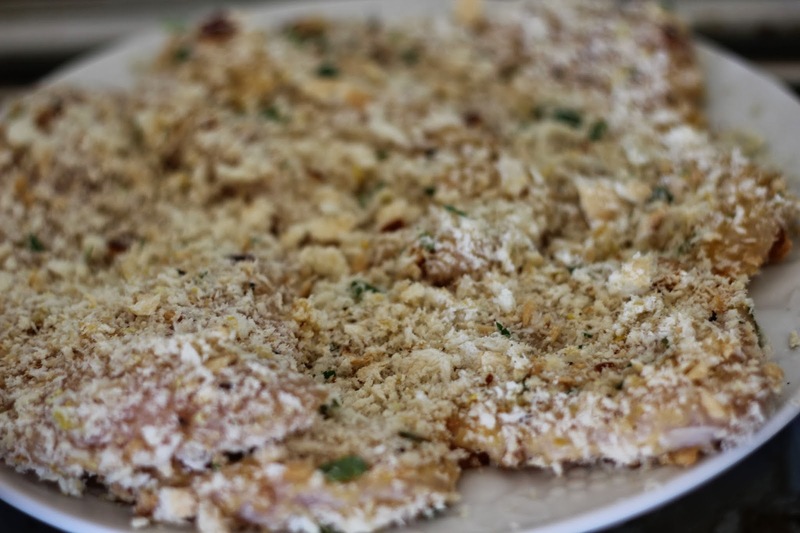 While I often make Teresa Cutter's "healthy schnitzel", I've never made a generic chicken schnitzel before. True story. I saw this simple recipe on Better Homes and Gardens a few weeks ago and gave it a go. The (not-so)shallow frying part made me a little uncomfortable, but damn it was tasty. Served with some oven baked chips and salad, it made a hearty dinner for a balmy summer evening. Finally, in my kitchen is an assortment of things that really don't belong in the kitchen. For some reason my Garmin has taken up residence on the kitchen bench. This is usually where I dump it after coming in from a run and immediately taking up parenting duties, often before a shower. The teddy has a hole, but I can't for the life of me find it. Until I can remedy the leaking beads, he is off limits for little fingers. 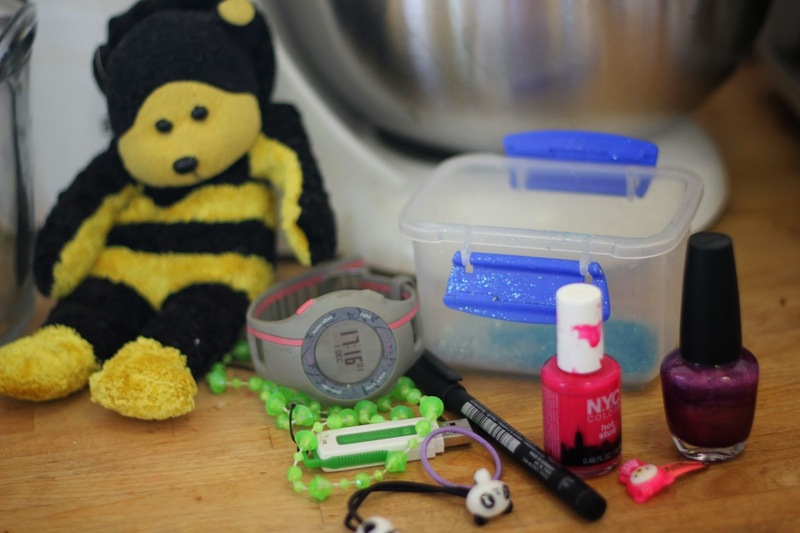 Having a house full of girls, there is always nail polish around, and toy jewellery, and hair accessories, and glitter (the remains of a Christmas ball decorating session are in the little container). The white-board marker is to write on the lists I have stuck to the pantry door; one for hubby, one for myself. These lists consist of non-urgent jobs that need doing, that we know in the back of our minds are there but keep putting off. So far the list technique is working wonders. We only put a few things on at a time so it's not too daunting, but wiping things off is very satisfying, as is seeing the work get done. That's what's going on in my kitchen this month. To see what's happening in some other kitchens around the world, head over to Fig Jam and Lime Cordial. I may not be back before the fat man comes, so Merry Christmas everyone! A friend of mine has a little girl the same age as Poppet with an egg allergy. We see them a couple of times a month, and I often like to bake a treat for the kids and the grown ups, so I kind of made it a challenge to come up with a variety of egg-free treats that the littlies like. Since the egg allergy diagnosis, my friend has observed some other food intolerances including dairy. While there are plenty of egg-free recipes out there, omitting dairy from the equation makes things a little more difficult. 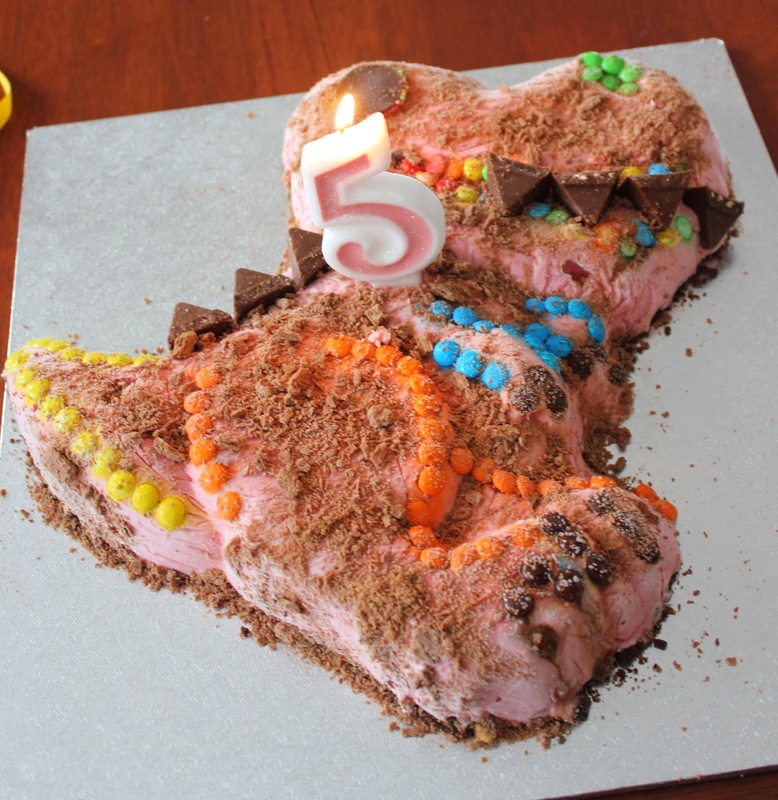 I'm always up for a bit of a challenge in the kitchen, so when my friend asked me if I would make her daughter's third birthday cake, I replied "Challenge accepted!" Preheat oven to 180C. Grease and line 20cm round cake tin. Cream Nuttelex and sugar using an electric mixer until light. Mix baking powder, water & oil in a bowl then add to butter mixture gradually, beating well after each addition. Add vanilla essence and beat to combine. Transfer mixture into a large bowl. Fold in the sifted flour alternately with the milk. Stir until just combined. Spoon into the tin and bake for 45 mins or until a skewer inserted into the middle comes out clean. Leave in the tin to cool a little then turn onto a wire rack. To make the buttercream, beat Nuttelex and sifted icing sugar with an electric mixer until light & creamy. Add the almond essence and beat until smooth and fluffy. 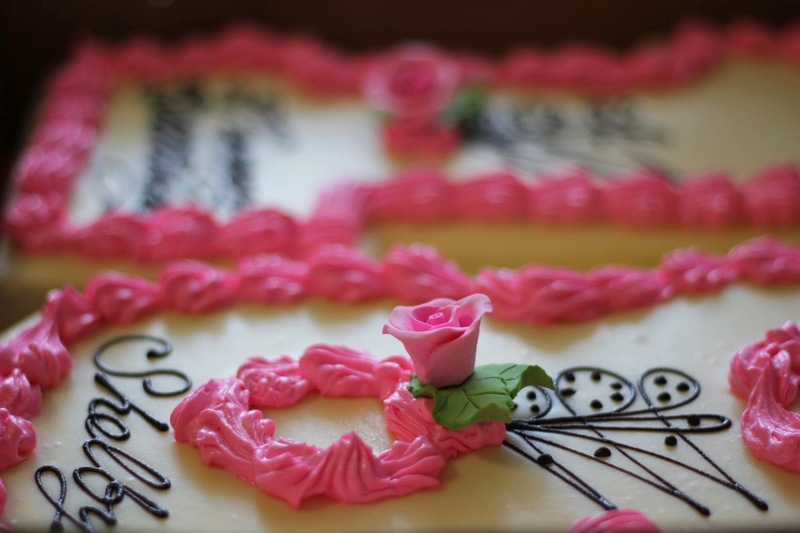 Spread over the cold cake and decorate as desired. I doubled the recipe as I was making a number 3 and needed two round cakes to do this. The cake itself turned out really well. Moist yet fluffy, and held its form well enough to cut and shape. Getting the buttercream right was a bit more tricky. Nuttelex has quite a distinct flavour and this wasn't masked by vanilla extract, which is why I used almond essence. That stuff is strong! Definitely strong enough to hide the fact that there's no butter in that icing. You could probably get away with 1/4 tsp. A three year old birthday also called for something more exciting than plain white icing, so I used pink and blue food colourings to make pink and purple. 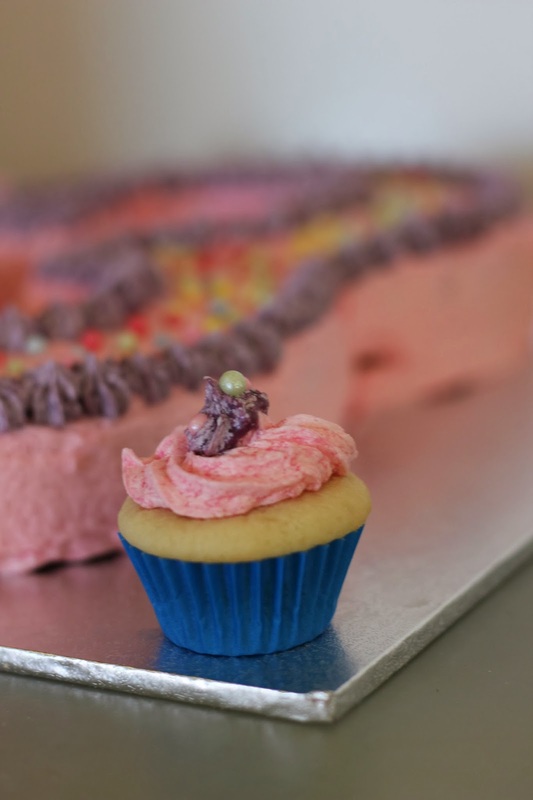 The oil in the Nuttelex can cause the buttercream to separate a little, and this was more obvious when using food colouring, leaving the icing a little streaky and clotted-looking. I tried to minimise this by keeping the colours fairly light. You can see the streaking slightly in the pic of the cupcake below. The resulting cake (and cupcakes) was impressive, even if I do say so myself. Those who didn't know it was egg- and dairy-free didn't pick it, and those who did commented on how "normal" it tasted. I actually preferred the taste over a normal butter cake which I usually steer away from. 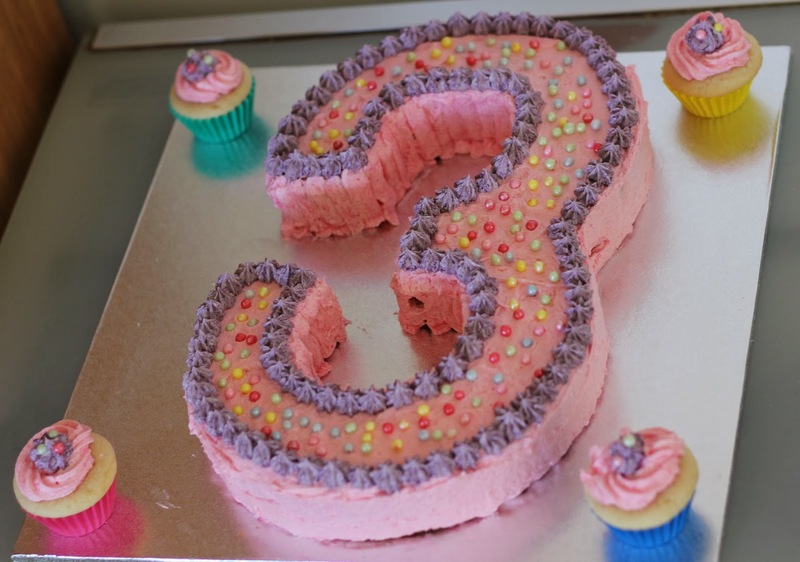 The cut parts of the cake (the inside edges of the number 3) were difficult to ice, and I used a flat tip on my piping bag and piped in strips so as not to agitate the cake crumb. This looked a little bit dodgy but less dodgy than having cake crumb strewn through the icing. Even the little coloured balls on top were egg-, dairy-, soy- and everything else-free. With about 8 weeks to go before the Perth City to Surf, I decided to commit to the half marathon (21.1km or 13.1 miles) and up the training. My running buddy was training for the full marathon (42.2km or 26.2 miles) so slotting into her long runs was easy. I had worked up to about 30km a week since Blossom was born but had to up the ante a bit to make this a race rather than a run. I included a couple of speed sessions to the week and increased my long runs to bring the weekly total to around 45-50km. Non-runners don't always understand that "racing" very rarely means "trying to win". It always means trying to achieve a goal, whatever that may be. I had run up until 38 weeks into my pregnancy and started again 3 weeks after Blossom's fairly straight-forward birth so my fitness wasn't that hard to pick back up. I knew I'd worked hard in the lead up to the race and I was in good enough form to break my PB of 1:45:48 from Darlington last year. I had hopes of going sub 1:40. I'd run a 1:43 in training and felt good. The only foreseeable hiccup was the terrain (and maybe the devil that invariably parks on my shoulder screaming doubtful messages during a big event). The Half Marathon of the Perth City to Surf begins uphill, then heads into the beautiful but elevated Kings Park. I hadn't trained on hills at all and didn't really know how to pace up or down the hills. The race started a little late as we waited for road clearance from the marathon runners. It was drizzling but there was little wind and the temperature was cool. Perfect racing conditions. I was in the first start wave and as a group, we jogged from our marshaling area and surprisingly straight through the start line. That was it, it was on, straight up the first hill, then the next. I found myself becoming disillusioned with my pace uphill so flew down the downhills and was hurting early as a result. Seeing the pain in the faces of some of the marathon runners as we crossed paths (they had started 3 hours prior and some were still only half way through their journey) filled me with empathy. That was pain I would partly understand later in the race. I'd foolishly written the 5km splits needed for a very ambitious goal time on my hand. When I was out by over a minute for the first, that devil spoke up. The rest of the race would be undulating. Both in terrain and in my mental state. I found another runner whose pace suited me and we stayed pretty close together for the entirety of the course. The hills hurt, my quads were killing me and I was having trouble maintaining the 4:40min/km pace I really wanted to be sitting on. I had a baby who would be ready for a feed waiting for me at the finish line, and I just wanted it to be over. Somehow I made it to the 20km mark and managed to pick up the pace for the last km. As I headed towards the finish line, my running buddy (who had been waiting for an hour and a half because she finished the marathon in a phenomenal 3:11, and placed 6th female) was yelling "Go Pam!" I was glad someone was there to see me cross the line. Hubby had been busy negotiating public transport with Blossom and amongst the spectators for the 48,000+ competitors, had missed me finish. I stopped my watch at 1:40:55. My official time was 1:41:00. Most people didn't, and won't understand, but I was devastated beyond belief. I had just run a PB by 4 minutes, on a brutal course, 7 months after having a baby and in between breastfeeds, yet I was disappointed I hadn't run my goal time. Upon reflection, I am proud of my result. I tried my hardest and ran a good time. The act of planning and training for a major event helped pull me out of a low patch, and mental health is the main reason I run, so for that I am grateful. I'm going to lay off racing for a while and enjoy just running for the rest of the year. I've got my sights set on a marathon in 2014, and I'm determined to get that sub 1:40 half that I so desperately wanted from the City to Surf some time soon. I accept that some weeks I won't be able to run as much as I like, and maybe I won't experience my running potential until the kids are a little older and I can put more hours in (but hopefully before my body decides it's a little older though!) but if I can run a marathon and have 3 proud little faces waiting at the finish line, then I'll be a winner.